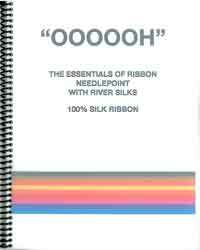 Description: With the introduction of 100% silk ribbon from River Silks Ltd. stitchers of needlepoint canvases have new opportunities for creating effects, textures and elevations never before possible. The book shows how to use River Silks silk ribbon in a variety of traditional stitches done on needlepoint canvas, alongwith the techniques applicable to and unique to silk ribbon. Also includes hints on canvas management, how to get started and how to get creative.